After what was termed as a lost decade as far as building up the strategic assets from the national security perspective, during May 2014, India witnessed the beginning of a refreshing innings by a most prolific team under the leadership of a dynamic political leader Narendra Modi taking the helm. The stage was now set for a swash-buckling innings. Indeed, the innings did begin with a big bang as far as the Indian Navy was concerned! 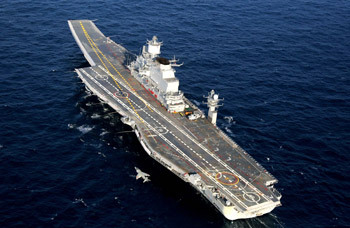 A new Chief of the Naval Staff (CNS) who assumed the office around the same time of the regime change at the centre, wasted no time and efforts and INS Vikramaditya, newly acquired, refurbished and modernised aircraft carrier, with the new Prime Minister embarked on board was dedicated to the nation. 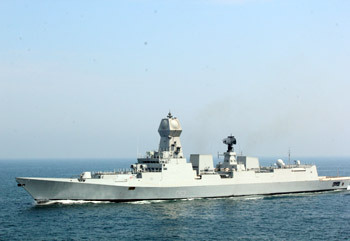 It was not a mere ceremonial throw-back, it enormously up-lifted the sagging image of Indian Navy which had taken severe beating due to few unfortunate incidents on board operational platforms, leading to untimely resignation by a serving CNS, a first of its kind in the annals of Indian Navy's history. In consonance with its professed vision to build a new strong India, the Prime Minister launched a major policy initiative and termed it as 'Make in India' to take India's pursuit of indigenisation and self-reliance to newer heights. The slogan of the new campaign caught the imagination not just in India; it was positively received globally too. 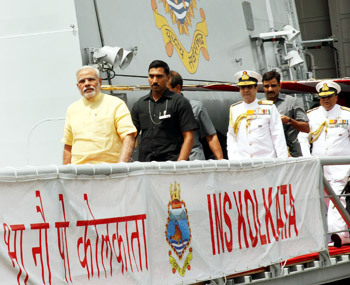 To prove his commitment towards the campaign, Prime Minister commissioned state-of-the-art guided missile destroyer, INS Kolkata built by Mazagon Docks Limited, Mumbai on July 10, 2014. Warship building is a tedious, most complex and technology intensive process with long gestation periods. To make the force development and force structuring viable it needs to be backed by efficient decision making, requisite infrastructure and commensurate resource allocation. While it was hoped that the new regime will significantly fine-tune the processes, there are wide shortfalls witnessed on the ground. Ministry of Defence (MoD) under the directions of Prime Minister was asked to review all of languishing naval acquisition programmes and to be placed under the ambit of 'Make in India'. To begin with, this major policy shift made very positive ripples. Manohar Parrikar, an illustrious Chief Minister of Goa, was hand-picked by Prime Minister to steer the proceedings at MoD with newer zeal and enterprising initiatives. 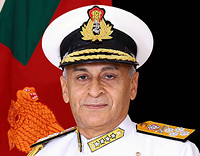 He too began his innings at MoD with sole intent of making a change in the prevalent indifferent and lackadaisical environment in pursuing the Long-Term Maritime Capability Perspective Plan. Launch of 'Make in India' campaign came out of the promises of radical and systemic changes as per manifesto of BJP for General Elections 2014. It promised the re-vitalising of the moribund public-private partnership in the defence industry. Undoubtedly without the effective partnership of the private sector visible improvements in defence production will not be possible. It was expected that there will be adequate incentives, encouragement, enabling provisions created to give positive boost for private sector's participation. While the Defence Procurement Procedures have been routinely reviewed, amended, revised, etc. forward looking provisions like Strategic Partnership mechanism have been given mere lip-service. While in the very recent past there has been some forward movement in this direction, its implementation may take a couple of years to be in place. While 'Make in India' campaign is seen as made to order for the Indian Navy schemes for force level development which are largely founded on indigenisation and self-reliance, invigorating provisions to concretise 'Make in India' into a reality are sadly lagging behind. The flip side of the abrupt switch to 'Make in India' paradigm resulted in re-inventing the wheel. The first major casualty of this policy shift was Project 75I for indigenous construction of conventional submarines. After the delays spanning over a decade or more and just when this vital project had begun to see light at the end of the tunnel that the Government decided that Project 75I will henceforth be steered as 'Make in India'. The second most essential project affected by the policy shift is naval multi-role helicopters (NMRH) and light utility helicopters (LUH). Reportedly this will now be steered as 'Make in India' as a joint venture (JV) project with Russia. This decision is bound to encounter unforeseen delays while negotiating and finalising the contours of JV, joint manufacturing mechanism, creating and installing requisite indigenous infrastructure. The anti-submarine warfare (ASW) capability of the frontline ships will be further affected, in addition to other operational integral air requirements of the ships of two fleets and shore-based flights. Since 2008, Indian Navy is finding a suitable replacement for the Seaking by floating a global tender for 16 helicopters with an option clause for another eight for its warships and for upgrading diminishing ASW capabilities of her fleet. 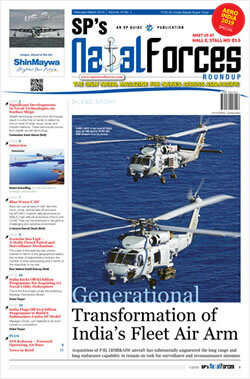 In the open bidding process, the US firm Sikorsky was selected in December 2014. 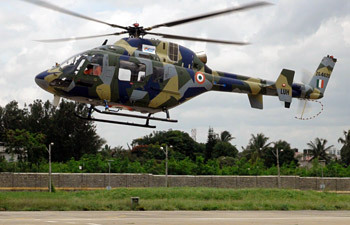 Sikorsky emerged as the sole successful bidder, after the Italian firm Finmeccanica was ruled out of the competition due to the allegations of scam in VVIP helicopters deal by the Government of India. Seahawk S-70B can be very effectively used as an advanced ASW and anti-surface warfare integral air to take on the underwater and over the surface threats. It is now reported that MoD is contemplating to junk procurement of 16 S-70B Seahawk helicopters from Sikorsky. Indian Navy in response has submitted a 'Dissent Note' stating that these helicopters are a critical operational necessity. Likewise, acquisition process for 12 mine counter-measure vessels (MCMV) for Indian Navy began nearly a decade ago. When the project of acquiring MCMVs through import was scrapped, in August 2015 Goa Shipyard was nominated for indigenous construction in partnership with a foreign shipyard. There are uncertainties still looming large over when the contract will be signed and the manufacturing process begin!